When in Rome, most visitors focus on major tourist itinerary monuments clustered in and around the Capitolium, Forum and Palatine. Yet many Roman neighborhoods are home to very important monuments of the ancient past and it can be well worth the effort to get off the beaten path to visit these. This writer’s favorite such neighborhood is the Aventine Hill, located along the eastern bank of the Tiber. It is the southernmost of Rome’s famed Seven Hills. Compared to the frenzy and traffic found in much of the central City, the Aventine is a relative island of calm. Most of the area is residential, with several large green open spaces, and it is connected to the equally quiet Trastevere neighborhood across the Tiber by two bridges. Getting there is easy, with major transit stops at Circo Massimo and Bocca della Verita. Alternately, one may take a long leisurely stroll along the Tiber from central Rome, starting where the Ponte Fabricio connects to the Tiber Island. Most of the neighborhood’s major monuments, and those with the most charm in this writer’s view, are to be found in a small area centered on the Piazza della Bocca della Verita. This Piazza is so named for the famous “Mouth of Truth” located inside the portico of the Church of Santa Maria in Cosmedin, which has foundations going back to the 6th Century. According to a many centuries old tradition, the visitor would insert their hand in the mouth and the mouth would snap shut if the visitor had told lies. The Mouth was made all the more famous by a scene in the 1953 film ‘Roman Holiday” with Gregory Peck and Audrey Hepburn. 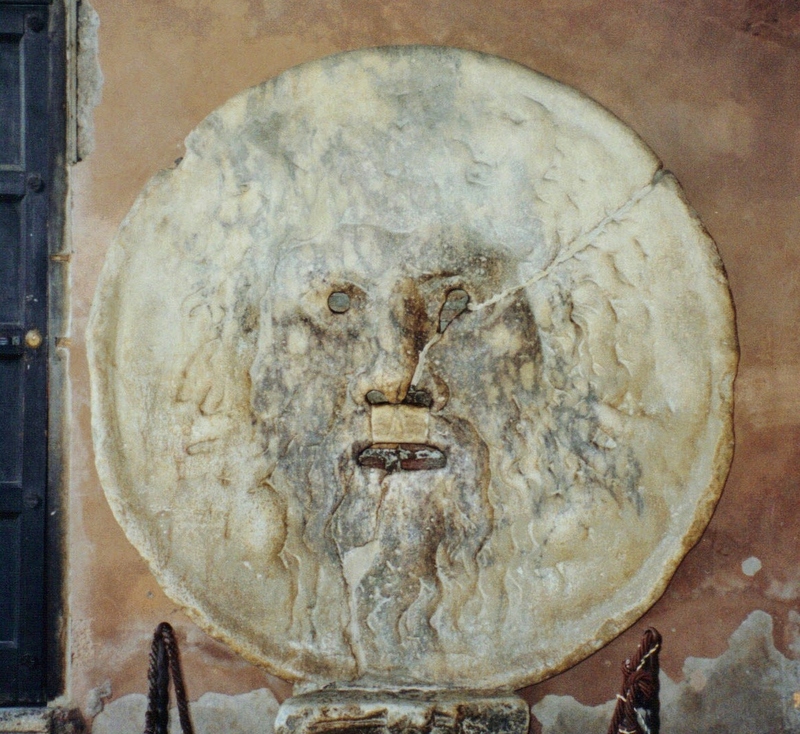 In fact, this huge white marble disc with the face of a river god may simply have been a large drain cover during the Roman imperial period. Just around the corner is the Arch of Janus. 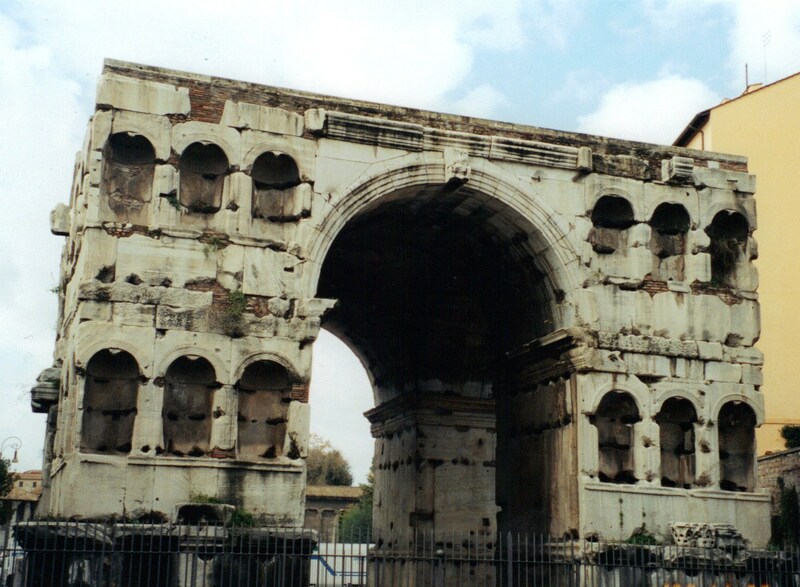 Dating from the first half of the fourth century, probably during the reign of Constantine the Great or one of his sons, the Arch today is almost completely stripped of its original decorative elements, giving it a strangely stark and modern look. It is an imposing structure, just the same. 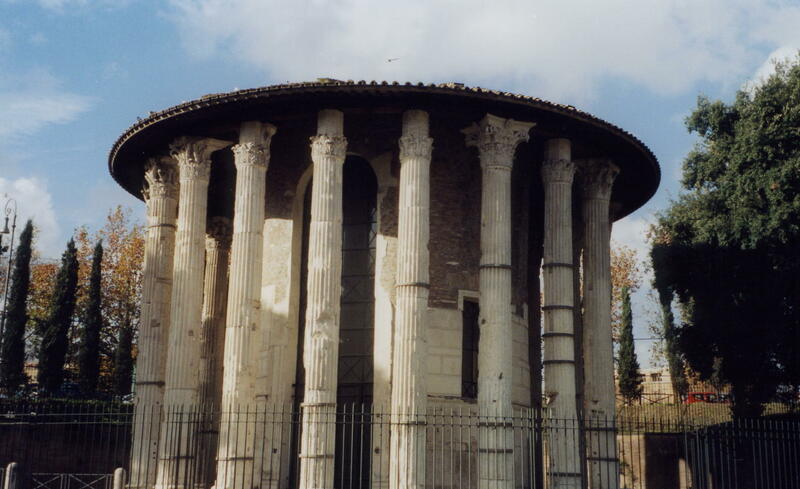 Alongside the Tiber, just a couple of hundred steps away from the Arch of Janus, shaded by umbrella pines, are the temples of the Forum Boarium. These two small temples are famed for both their remarkable state of preservation and for being almost unique in the repertoire of Roman architecture as survivors from the Roman Republic. Both buildings date from the 2nd Century BC. 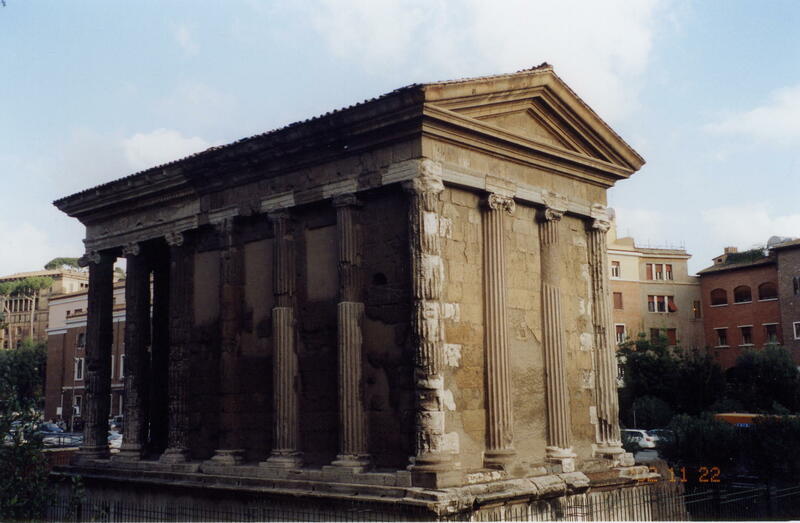 The more conventional of the two is the Temple of Portunus, dedicated to the god of rivers and ports, as there were once docks and related facilities here for the unloading of goods coming up the Tiber. 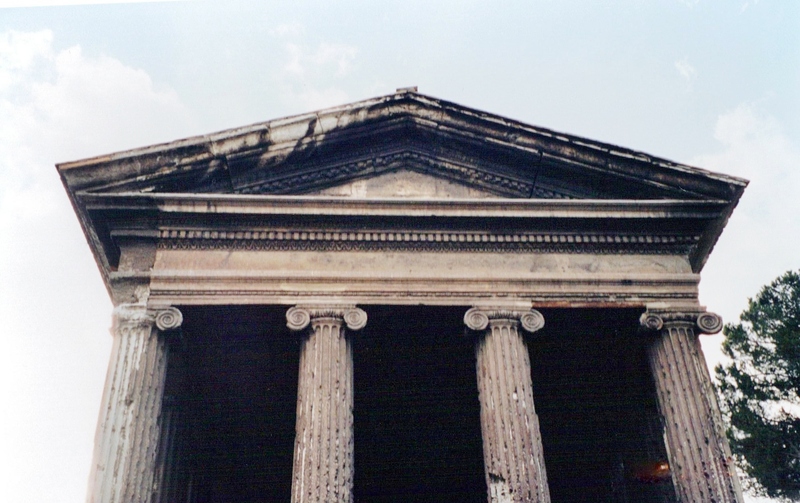 Set on a high podium, the harmonious facade features simple lines and beautiful Ionic columns. The more unusual of the two, due to its circular format, may have been dedicated to Hercules and features elaborate Corinthian column capitals. Among the many churches with ancient foundations in this area, one stands out – San Giorgio in Velabro. Dating mainly to the 7th Century and incorporating many ancient Roman columns, along with a Roman “mini-arch” of the Severan period, a charming 12th Century bell tower and 13th Century frescoes in the apse, the church also incorporates numerous inscribed ancient fragments in its portico and in the walls of the nave itself. This building is a sort of palimpset of Rome itself and is well worth a visit. While there is much more to see in this small area, one more spot at the southernmost end of the Aventine is also worth visiting. 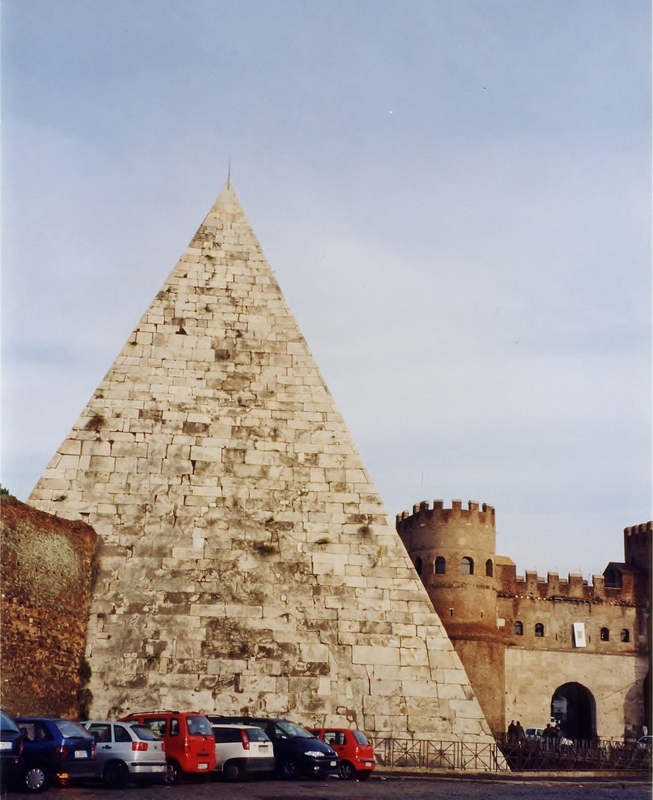 Very close to the Pirimide Metro station is the Pyramid of Gaius Cestius. 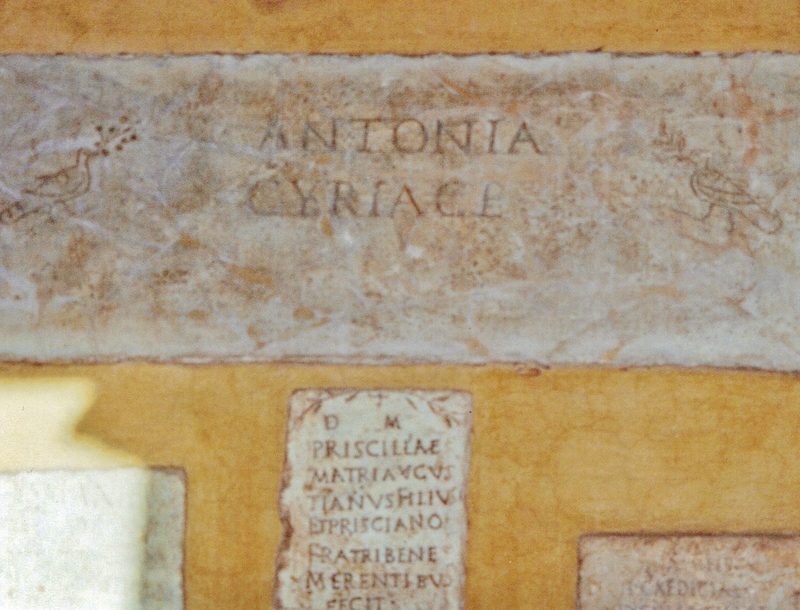 This is actually a tomb constructed for a Roman official of the same name who died in 30 BC. This was the time when Egypt had come under Roman control with the death of Cleopatra VII and “Egyptomania” was all the rage in high end Roman artistic circles – some things never change! Unlike the true Egyptian pyramids of over 2,000 years earlier, this structure was built of concrete encased in white marble. In the late 3rd Century AD it was incorporated in the Roman defensive walls completed by Aurelian. Just across the street from the Pyramid – and watch out for the traffic here – there is an island of peace at the Protestant Cemetery, so called because during the many centuries of Papal rule non-Catholics could not be buried inside the walls of Rome, the same walls built by Aurelian. Here one finds the final resting place of many famous visitors to the Eternal City, including the great English romantic and poets and lovers of antiquity, Percy Shelley and John Keats. If you found this post useful or interesting, please let us know and we will post additional stories about travel to Rome and other ancient sites.